EBC do fit, FA252HH is the model I got and perfect fit. Those are pads, he's talking about rotors. looks like the italian firm- braking- has wave rotors oem size-part [HASH]WK132 for fz-07-306 bucks for each rotor.i have used their rotors before,very good quality,but expensive.
" the I.D. and bolt circle are the same but the O.D of the 07 is 282mm and the O.D of the 09 is 298mm....."
Are they the same bolt pattern ( ie will they bolt straight up.) Sounds like an opportunity for a little bigger disc mod to me. 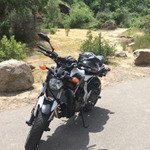 Lots of comments about how people think the MT/FZ 07 brakes aren't strong enough. There is you answer right there. 09 rotors and offset the calipers.